Governance is not about such things Andrew, and it is cheering to see JT showing his experience and saying so. All JT has shown us is that he is an arrogant vapid jerk with below-average intelligence. He may have "experience" now, but he's still a bonehead, and will continue to be a bonehead, unworthy of Canadian votes. You mean like the jerk Harper who said that "a smart prime minister would get along with the US president (Trump)"? So Harper, who absolutely could not get along with Obama, must be a complete dummy? Then that dummy Harper is trying to throw JT, Theresa May, Macron, Turnbull, Merkel and pretty much every reasonable world leader under the bus because? the dummy Harper is such a "slow" person? JT is a humble friar next to the arrogance of Harper and his protege mini-me Scheer. Get real GB, hurling schoolyard insults gets you nowhere, primary schoolboys can't vote. Governance requires a balance, a balance that Harper an the Conservatives failed miserably to produce. Like it or not, the Liberals have restored some the missing balance that Harper and the Conservatives could never achieve because of ideological constipation and continually pandering to the far right. I know, you can't stand JT. Fine. He won't invite you to the next fancy dress party. You can go and have burnt coffee and stale doughnuts with the grim and characterless Scheer. You would be far better off politically to watch the right flank of the Conservatives under the "no stand on anything" Scheer, Max is indeed going to chew him up, because he actually has positions, and some of them represent constructive ones. But then, if Max's organization really does get off the ground as well he is trying to achieve, you might not care and vote PPC. I know Andy is scared of Max. Andy knows a real leader when he sees one So he attacks JT (with schoolyard nonsense) but keeps looking over his shoulder at Max - and yup, the PPC is coming. where a balanced approach, not Harper and Conservative "nasty" is required. Foot stomping simplistic approaches are DOA, we must patiently work our way through them. Unless, of course, the Conservatives and their "points in the game" guy have the chutzpah to for a constitutional amendment? Do they? Methinks not - Harper didn't. Mini-me Scheer certainly doesn't. At least Max has the chutzpah to say that he wants to explore scrapping the Indian act - with consultation. IF such an historic agreement could be reached... it could be better for all. Note that Max emphasizes "with consultation". I would suggest that virtually anyone that has had to actually work for a living is better qualified to be PM than Justin. Justin has never had to live on Ichiban noodles for a week so he could afford to pay rent, never had to save for a down payment, never had to deny himself anything in order to put his kids needs first. blueliner wrote: I would suggest that virtually anyone that has had to actually work for a living is better qualified to be PM than Justin. Justin has never had to live on Ichiban noodles for a week so he could afford to pay rent, never had to save for a down payment, never had to deny himself anything in order to put his kids needs first. keep voting for your "old stock" party then. you can still be the opposition after. your votes for a party that stinks is whats inept. Can Trudeau's peanut chuckers explain to us why they think this is how Trudeau should answer to the people who pay his wages? It was a simple and direct question to Prime Minister Justin Trudeau at a town hall meeting in Regina Thursday, politely asked by a young woman, that spoke volumes about today’s politics. About how you don’t have to yell at politicians to be effective in challenging their views. And about how the prime minister – and politicians in general – routinely brush off questions they don’t want to answer by using the tired, old and cynical political spin technique called blocking and bridging. It means blocking the question you’ve been asked and bridging away to answering something else. Media consultants and political handlers think it’s clever. What it really demonstrates is the politician’s contempt for the questioner, which is fine in Question Period because that’s essentially political theatre, or when a politician does it to the media because it’s our job to interpret political bafflegab. But it’s insulting when Trudeau does it at a venue where we’re supposed to be impressed, according to his cheerleaders, by his willingness to talk openly and honestly to Canadians in informal settings. “Welcome to Regina, Mr. Prime Minister. I would like to bring attention to comments you had made back in November when you had spoke(n) about the gender and social impacts construction workers create in rural areas. (Applause) Although not a construction worker, I myself am an oil field worker in addition to being a full-time university student and have spent my summers temporarily relocating to various rural areas in Alberta, Saskatchewan and Manitoba to work on oil field related projects. “During my time working in the oil field as a young female, I have come across some of the kindest and most respectful male co-workers and have created lasting friendships (Applause) in the rural towns I have temporarily re-located to. I work very hard and have dedicated a lot of time in the oil field industry during my summer(s), in order to keep up with increasing tuition costs and I feel that you have painted myself, my co-workers and friends in a negative light with your comment. Here’s Trudeau’s response. Note how he’s not answering the question, but blocking it and bridging away to an entirely different topic. “Thank you for your question and thank you for your hard work. Construction workers build this country every single day. The work you do and the work your colleagues do around this country building our roads, building our bridges, building our homes, building our factories, building our country every day, is an essential building block of the country and the future we’re building. burnedatstake wrote: your votes for a party that stinks is whats inept. right back at you. Anyone who thinks that their vote for the bumbling inept and disgusting Liberals is somehow an act of moral superiority is horribly naive, and just plain silly. It's time to send the arrogant clown JT packing. This is just unacceptable behavior. 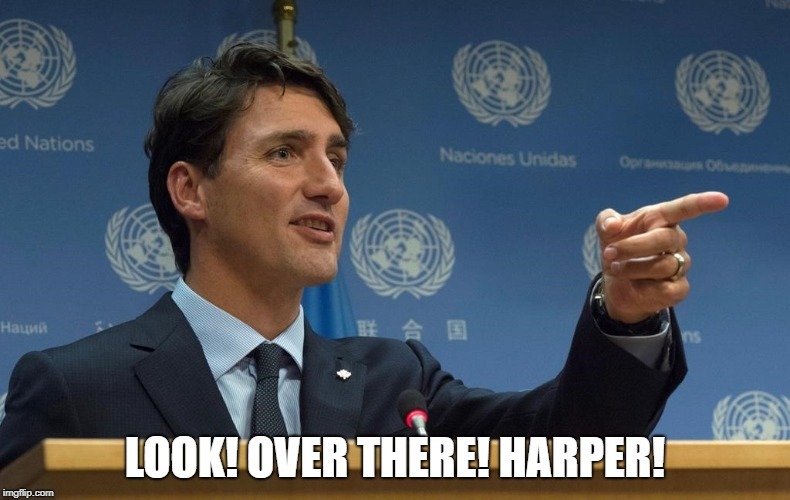 Yes we know Liberal peanut-chuckers: "HARPER!!!" And now our friend Hair'n'Sox wants to tax the pensions of old folks who may have forgotten about accounts they own. Ah yes, Trudeau is stooping to picking up discarded cigarette butts in the gutter in his lust for tax money. Millions of dollars owed to ordinary Canadians sits unclaimed in dormant bank accounts and terminated pension plans — and the federal Department of Finance is looking at fresh ways to tax some of that idle money and to reduce or eliminate any interest paid on it. I don't know who the "jerk" Harper is, but I was thinking more along the lines of Justin's evil dad Pierre. Except that Pierre had a brain, and the son doesn't. He's just a vapid empty arrogant puppet. No, JT is an empty-headed weak-kneed wimp next to...well pretty much anyone. Just a useless waste of space. Then you should start practicing what you preach. Governance requires a balance, a balance that Harper an the Conservatives failed miserably to produce. Once again, don't know why you are babbling away about Harper, but government also requires intelligence and for our leaders to be humble, a balance that the Liberals have failed miserably to produce. The arrogance is off the charts, and so has been the stupidity. I'm not a fan of lies, so I will choose "not" as my option here. I know, you can't stand JT. This is far too simplistic a statement. It's not about "can't stand". 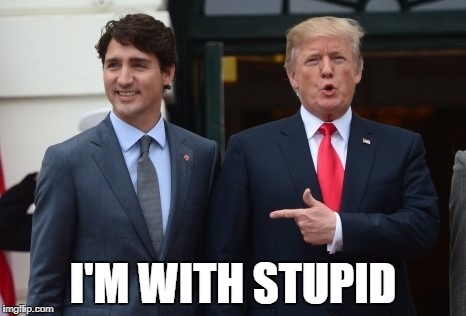 What I don't get are why so many Canadians just turn off their brains and give this mentally-challenged turd pass after pass no matter how stupid his actions. He can shrug off 18 questions about his ethics in the House, and the trained sheep just continue to applaud. It is just baffling how content these people are to be fine with being treated like *bleep*. I don't get it. I know I know - HARPER!! Fine. He won't invite you to the next fancy dress party. Not quite sure what you are talking about, but if you referring to a party where he dresses up in the clothing of another culture and jumps around like an idiot, then I am most grateful for not being invited. You can go and have burnt coffee and stale doughnuts with the grim and characterless Scheer. Not sure why I would have burnt coffee, or stale doughnuts (really odd suggestion, are these favorites of yours?). I have met Andrew Scheer, and found him to be anything but "grim and characterless", and in fact quite the opposite. If anyone wants to watch Scheer making mince-meat of the cranially-challenged Liberals in the House, or watch his speeches at the annual Media dinner (the same media dinner where a few years ago a drunken Lizzie May made a giant fool of herself) you can see that he has quite the sense of humor. So your characterization of Scheer is actually extremely disingenuous. I haven't met JT (thank goodness) but I am basing my opinion of him being far below even basic minimum intelligence levels on a lot of evidence easily found online. I am basing my opinion of him being arrogant on such base evidence as his refusal to answer a basic question of a young woman in Regina about his insane stupid comment about "gender effects on small towns". It's just a constantly building mountain of evidence that this guy shouldn't be our PM. He doesn't deserve it. But yes, HARPER!!!! Because he sees JT isn't a leader. Yup, we agree on this. But yes - HARPER!!! Sounds like a good use of our money. Meme means nothing without a source.....looks like a photoshopped propaganda from the alt right. That's it Blackrock Reporter? Aren't they too busy suing and losing to actually doing any journalism? You have something besides them? ...perhaps Zerohedge or rebel? Last edited by floppi on Jan 13th, 2019, 5:31 pm, edited 1 time in total. Gone_Fishin wrote: And now our friend Hair'n'Sox wants to tax the pensions of old folks who may have forgotten about accounts they own. Ah yes, Trudeau is stooping to picking up discarded cigarette butts in the gutter in his lust for tax money. oh boo hoo to the baby boomers and their parents. crying a river over money they have ignored. JLives wrote: I welcome them to Canada. Freedom of movement is a human RIGHT. We share the planet, not individual countries. Borders are artificial and will eventually be obsolete. And the more we interact and sort our *bleep* out, the better. People can move all they want. No big deal. Migration and immigration are a different matter. Follow laws and apply to enter a country LEGALLY, not like the illegals have been doing. Without borders and not protecting those borders means there is no Nation or Country. That means there would be no need for Government or police or passports or any other current Government documentation. Say goodbye to CPP and OAS and welfare and Unemployment insurance. Anarchy. Those with the most ammunition wins as there would be no laws, no courts, no protection. Cut me off in traffic and you die. No law against it.